This statistic displays the share of respondents using Instagram in the Netherlands from 2015 to 2018, by age group. 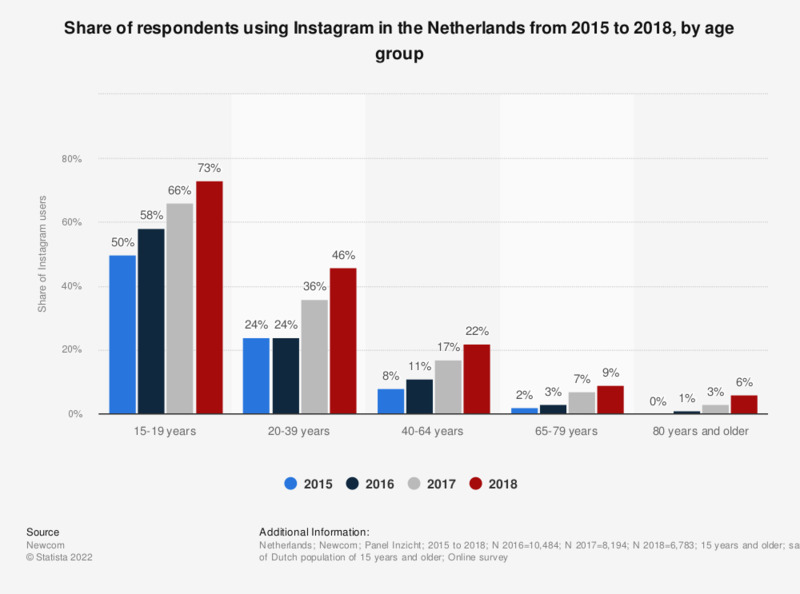 As of 2018, roughly 20 percent of Dutch respondents aged 40 to 64 years old used Instagram. Instagram usage of Dutch individuals is increasing among all age groups but the biggest rise in Instagram usage penetration can be seen among the Dutch population younger than 40 years old. Moreover Instagram's app is quite popular among the Dutch and it is one of the leading Android apps in the Netherlands. However, Instagram still lacks behind WhatsApp and Facebook when it comes to number of users. WhatsApp and Facebook remain the two most popular online social platforms in the Netherlands, with more than ten million users.